Blau und grün soll es diese Woche bei Think Monday – Think ATC & More sein. Für die Käferflügel habe ich tatsächlich mal wieder den schönen knalligen Cosmic Shimmer Mist rausgeholt. This week’s challenge at Think Monday – Think ATC & More is blue and green. To give the perfect touch to the bug’s wings I got out the wonderfully intense Cosmic Shimmer Mist. 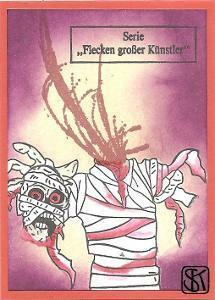 Ins Land der Pharaonen geht es diese Woche bei Think Monday – Think ATC & More. Ich hab’s da ja nicht so mit der Antike, dafür aber mit bunt. 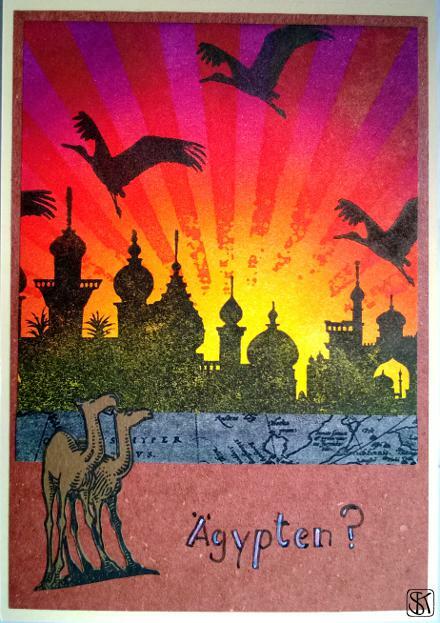 Alles in einer Farbe – das ist diese Woche das Thema bei Think Monday – Think ATC & more. Bitteschööön! Der Hintergrund ist in Resisttechnik gestaltet, mit dem sehr filigranen Abdruck eines Belichtungsmessermotivs. Wenn ihr sehr genau hinschaut, könnt ihr es in der unteren rechten Ecke erkennen. Besser habe ich das Foto leider nicht hinbekommen. All in one colour – that’s the current challenge at Think Monday – Think ATC & more. I made the background in resist-technique but it hardly catches in the photograph. If you look very closely you will find the very fine lines of a light meter motive in the bottom right corner. Look very closely, sorry ’bout the lousy pic! Schöne Grüße von den Cranberries. 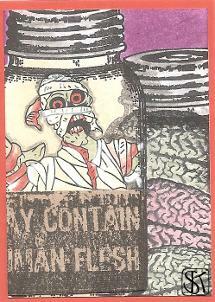 Zombie, Zombie, Zombi-i-ie. Hier in der Acapella-Version. 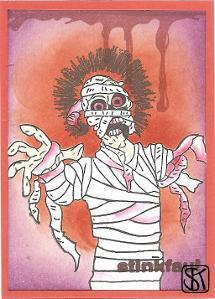 Halloweeniges für Think Monday – Think ATC & more. Bottom – Dept. where to put? 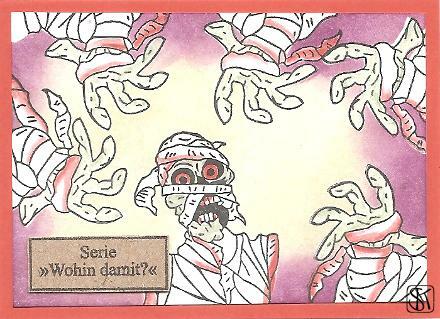 Diese Woche heißt die Herausforderung bei den Daring Cardmakers “ombre”. Sharon möchte von uns Farbverläufe von hell nach dunkel sehen, entweder fließend oder in Farbblöcken. Ich habe es mit beidem versucht. 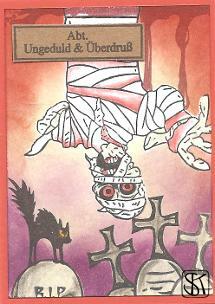 Und weil bei TMTA & more diese Woche Sterngucker und Planeten das Thema sind, darf meine Karte dort auch mitspielen. 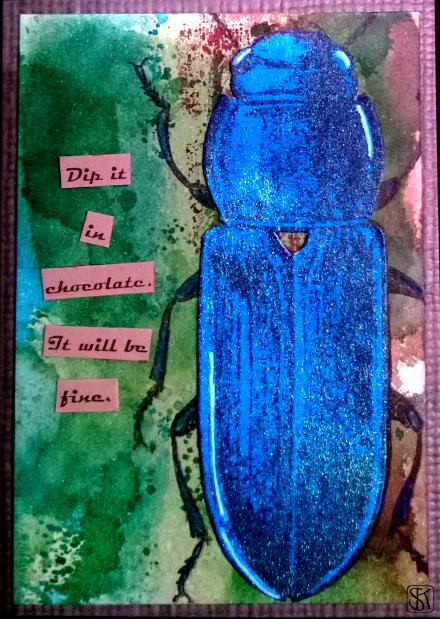 This week’s Daring Cardmakers‘ challenge is “ombre”. Sharon wants us to show colour gradients from light to dark, either with blended colours or in blocks. I have attempted a double take. And as stargazers and planets are the current challenge at TMTA & more I’m entering my card to play along there as well. Diese Woche sind bei Think Monday – Think ATC & More Tags gefragt. Dieses hier war dann tatsächlich mal ein Geschenkanhänger. 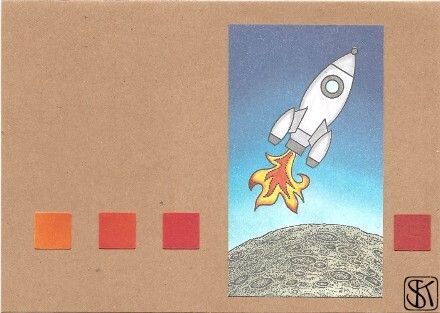 This week tags have been called for at Think Monday – Think ATC & More. This one really was a gift tag for once. Sean, Roger and Daniel are having a night on the town. Männer sind diese Woche bei Think Monday – Think ATC & More gefragt. Und der männlichste von allen ist und bleibt doch Herr Bond. 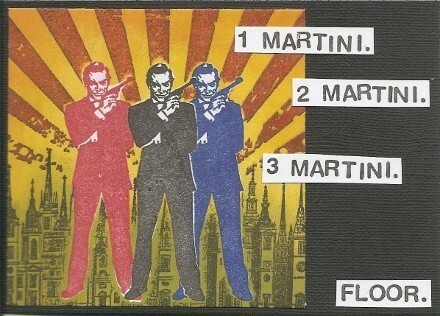 Nur wenn es zu viele Martinis werden… dann kann so eine Nacht auch mal ganz unmännlich enden…. 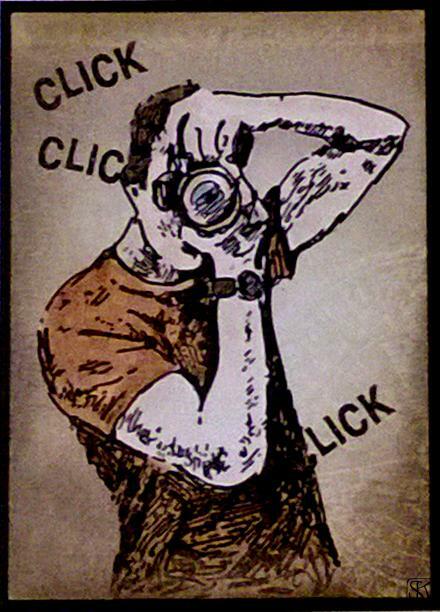 This week’s challenge at Think Monday – Think ATC & More is “men”. And the manliest of them all is forever Mr. Bond. Only, if there are too many Martinis… a night can come to a rather unmanly end at times…. Und weil es so schön bunt ist, qualifiziert sich das Tag auch für die aktuelle Challenge bei Think Monday – Think ATC & More. Mode ist das Thema der Woche bei Think Monday – Think ATC & more. Und wer anderes sollte einem da einfallen als die große Coco Chanel? Den Stempel habe ich schon ewig und dass ich die Karte gemacht habe ist auch schon eine Weile her. Aber erst seit vorgestern weiß ich, dass die Dame auf dem Foto tatsächlich Frau Chanel ist, fotografiert von einem anderen ganz großen: Man Ray. This week’s challenge at Think Monday – Think ATC & more is “fashion”. And who else could you think of than the great Coco Chanel? I have had this stamp for ages and it’s also been a while since I made this card but only this saturday did I learn that the lady actually is Madame Chanel as photographed by another great one: Man Ray.